Actual Play Podcasts Pathfinder 1st & 2nd ed. Star Wars Saga ed. "Content Creator Interviews" & More in the works! Star Wars Saga ed. "We shot first!" S2 Ep.21 "Caught Between A Gamorian & A Rock Place.."
Esplicito Star Wars Saga ed. "We shot first!" S2 Ep.21 "Caught Between A Gamorian & A Rock Place.."
Esplicito Star Wars Saga ed. "We shot first!" S2 Ep.20 "Gadiators!" Star Wars Saga ed. "We shot first!" S2 Ep.20 "Gladiators!" "DICE, Before Dishonor!" S1 Ep.8 "The Ol' Switcheroo..."
Esplicito "DICE, Before Dishonor!" S1 Ep.8 "The Ol' Switcheroo..."
Star Wars Saga ed. "We shot first!" S2 Ep.19 "Face Off, Mono E Merrick"
Esplicito Star Wars Saga ed. "We shot first!" S2 Ep.19 "Face Off, Mono E Merrick"
Esplicito "The Foul Play Podcast" Ep 0 Clip "Hashing out a voice"
A "WAR FOR THE CROWN Actual Play Podcast! "Here is a PROLOGUE mini-series of 6 parts "Honors Echo" & will be tied into "The Man From Osirion" pod running "Birthright Betrayal"
And plenty of Maki Symphony! 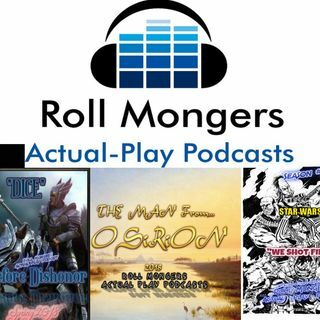 Roll Mongers Podcast Network: All Shows! Actual Play Podcasts! Star Wars Saga Rpg "We Shot FIRST!" & Pathfinder RPG's "DICE...Before Dishonor! "-War For The Crown AP, "Clinton's Core Classics" ROTRL AP, "The Man From OSIRION..." PF Society Pod, "Attack Of Opportunity! "-A Behind The Scenes Look At US! Star Wars Saga ed. "WE SHOT FIRST!" The Roll Mongers Podcast Network & DICE WISE Entertainment bring you Pathfinders "Hell's Vengance" thier first 'EVIL' Adventure Path! Thats right the Party isn't just misunderstood they are straight up EVIL! With Hells Rebels full of Chaotic goodness at the same time! Here is the long awaited actual play podcast series "The Man From Osirion"
Staring our own Frank Hamilton in the role that won him the 2017 Audition. "Master Arif" an elderly Scholar turned 'Cloistered Cleric' of Pharasma, from Pathfinders (arabic) lands of Katapesh. Who has traveled the inner sea region, ... Maggiori informazioni to study its Ancient lore. Only to be swept up into the Politics and Intrigue of the region. With the Eyes of The Powerful Sapphire Sage & the godess of Fate herself have certain plans for him, he struggles to remain master of his own Fate. Supporting a slowly rotating cast to help him, pulling inspiration from movies like Kingsman & The Man from U.N.C.L.E. this podcast is serious about tongue in cheek style humor and the world of intrigue derived from uncovering ancient lore! A List of Trailers & Clips from all our shows as well as up and coming projects!